Trooper came to the Joyful Horse rescue program a very scared horse. He had been acquired after failing to make it as a police horse. I was asked to work on Trooper to see if I could help him relax. Trooper held his head straight up and his eyes showed sheer terror. Trooper could not stand still and I had to walk quickly with him as I attempted to make some network chiropractic contacts. 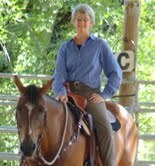 Network chiropractic is my favorite modality to help horses with emotional issues. I was not able to do any kind of an exam on Trooper but my feeling was that he was physically sound but emotionally traumatized. After several network contacts Trooper relaxed slightly. I was able to give him an oral dose of the homeopathic remedy, Aconite. Aconite is a remedy that helps the body recover from fear and shock. It seemed a good fit for Trooper. I saw Trooper again a month later. He had responded a bit to the gentle care he was receiving but I could see he was still very tight and untrusting. I was able to do an exam and found no physical issues. Trooper was able to stand for a network chiropractic session but his head remained high and he never relaxed. I felt Trooper needed some nutritional support to help him rebalance his system. Trooper fit all the criteria to be a Water horse so I started him on the Water Horse balancing formula. A few weeks after my last visit with Trooper I was thrilled to see a video of him on Facebook. He was being lounged and his head was down and he was obviously relaxed. The transformation was very obvious. Since then, Trooper has continued to respond to the good retraining program. He has gained weight and seems very happy. Trooper is a good case to illustrate how high levels of stress emotions can keep a horse from responding to training. Trooper needed the Aconite for his nervous system to get out of the vibration of fear but his body was still lacking in the nutrients it needed to reach a calm state for learning. The Water balancing formula supplied Trooper with the nutrients needed to produce calming neurotransmitters so he could shift into a parasympathetic or calm state and maintain this. Check out this video of Trooper and look at the great work done at the Joyful Horse ranch.